A blue whale killed by a ship collison is examined by Oregon State University researchers aboard their 85-foot vessel, the Pacific Storm. The feeding grounds of blue whales along the U.S. West Coast overlap dangerously with shipping lanes, placing the behemoths in danger of collisions with ships, researchers say. This finding could help prevent human threats to these endangered titans, scientists added. Blue whales are the largest animals that have ever lived on Earth, weighing in at 330,000 lbs. (150,000 kilograms) and reaching up to 108 feet (33 meters) long. They are gentle giants, grazing the oceans for tiny bits of food in seawater, with mouths large enough to hold 100 people. For instance, in 2008, five dead blue whales were discovered in the Pacific Ocean in a seven-week period, and three of them were confirmed to have been hit by ships. "That made everyone step back and say, 'Whoa, this may potentially be a big problem,'" said lead study author Ladd Irvine, a marine mammal ecologist at Oregon State University. To learn more about where blue whales roam in order to better protect them, scientists tracked them using tags equipped with satellite transmitters. 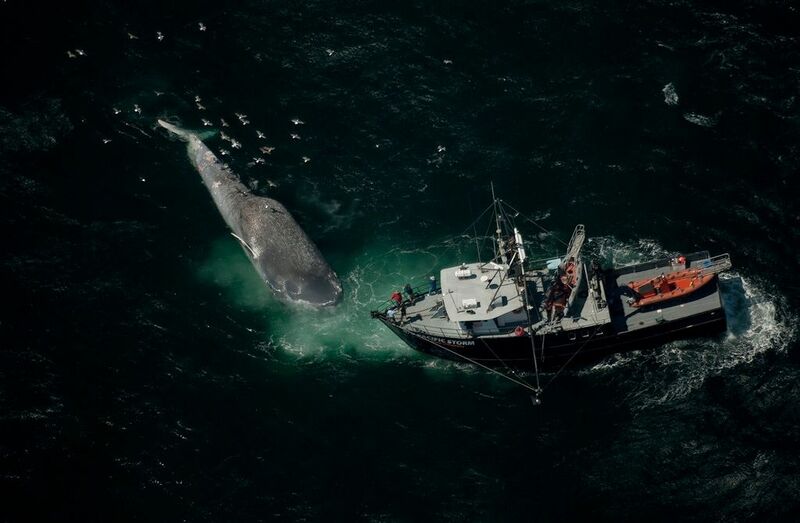 They attached tags onto 171 blue whales off the coast of California from 1993 to 2008, for the most comprehensive study of blue whale movements ever conducted. Attaching tags onto the whales is very difficult. The scientists analyzed the paths of blue whales within 200 miles (322 kilometers) of the U.S. West Coast to determine which areas were most important to the whales. An estimated 2,500 of the world's 10,000 blue whales spend time in the waters off the West Coast of the Americas, traveling from the Gulf of Alaska all the way down to an area near the equator known as the Costa Rica Dome. The ranges of, and distances traveled by, individual whales varied dramatically. Still, the blue whales consistently returned to feed in specific locations each year overall — areas with plenty of tiny shrimplike crustaceans known as krill. The researchers discovered that busy shipping lanes off Los Angeles and San Francisco overlap with the two areas of highest use by tagged blue whales off the U.S. West Coast during the summer and fall. "This raises the specter of ship strikes," Irvine told Live Science. To help save the whales, the researchers suggested moving the shipping lanes during the summer and fall, when the whales are most abundant. A similar relocation of shipping lanes in the Bay of Fundy, off eastern Canada, lowered the likelihood of vessels striking endangered right whales by an estimated 80 percent. However, such a change "is not an easy thing that can be done quickly," Irvine said. "Shipping companies do not want to do anything that makes them go farther and use more fuel," he noted. "Also, in the case of Southern California, the U.S. Navy has training ranges all around the southern Channel Islands area, and if the shipping lanes were moved south of where they currently are, as we suggest, they would go near the training range, so the Navy would have to be consulted and agreeable to make this happen." That being said, "it's in the shipping companies' interest to not hit whales," Irvine said. "When ships hit whales, the shipping companies' insurance companies require them to have their ships inspected for damage before they go across the ocean," Irvine added. "There are limited facilities to do that, and ships have to sit for a long time and miss out on income while they get inspected." This means protecting the whales "is a win-win for everybody, and that's always good," Irvine said. "You take whatever reason you can get." In the future, the scientists hope to use their data to help develop models predicting where blue whales might be. "We can use that data to help make the decision for a seasonal change or closure of shipping lanes," Irvine said. The scientists detailed their findings online July 23 in the journal PLOS ONE. Follow Live Science @livescience. We're also on Facebook &amp; Google+. Original article on Live Science.